The Scoop: Cassie Zampa-Keim has been working in the matchmaking industry since 1990, and she has watched it change dramatically over the decades. She founded her own matchmaking company, Innovative Match, in 2010 to keep up with the times and lend her sage experience to singles throughout the country. Today, her matchmaking team faces the difficult challenge of bringing people together in divisive times. Cassie told us that, in the last year, political opinions have become a dealbreaker for many of her clients, and that has negatively impacted her ability to find compatible matches. Clients who make snap judgments fueled by political biases limit themselves in the dating scene, and, in response, the matchmaker has become an advocate for keeping an open mind and putting politics aside when meeting a potential love interest. The 2016 election has had major impacts on foreign policy, economic growth, and social issues, but it has also affected the dating scene in some surprising ways. 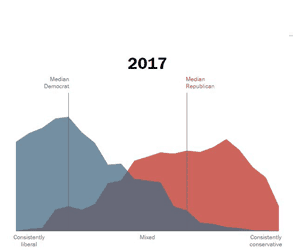 According to Pew Research Center polling data, American political polarization is at a 20-year high. In a survey in early 2016, 47% of millennials said they wouldn’t date someone whose political beliefs differed from theirs. That’s a pretty high number, but it has jumped significantly since the fallout of the presidential election. According to Match.com’s internal data, 60% of today’s singles said they’re less open to dating across party lines than they were two years ago, and 91% of liberal respondents said they negatively judge potential dates who voted for Trump. Matchmaker Cassie Zampa-Keim has also noticed this shift in perception among her clients. She told us the most common dealbreakers she used to hear were about religion or family values — now it’s all about the voting booth. In the last year, Cassie has seen clients outright reject matches who were compatible in every other way because they couldn’t get past a vote for Trump or Hillary. Innovative Match, Cassie’s boutique matchmaking company, is on a mission to bring people together, even while current events continually drive them apart. Cassie is working hard to bridge this divide by persuading her clients to keep an open mind as they search for love. Her encouragement and support has made a difference in hundreds of people’s lives, and she told us she hopes to continue to be a positive influence on the dating scene, especially in these tumultuous times. Cassie has been making matches and facilitating love stories since 1990, and in that time she has kept a close eye on what her clients want and how they choose their life partners. She said she has never seen political views disrupt dating preferences like they are today. The polarization in the US has impacted the dating scene as a growing number of liberal and conservative singles refuse to cross party lines when seeking a date. Modern daters often don’t feel like they have to settle because they have so many options available. They think they can afford to rule out an entire segment of the population because they expect another date to always be a swipe away. Dating sites and apps often lead singles to make snap decisions about one another, and Cassie said those superficial judgments have become a systemic problem in the modern dating scene. Cassie said her matchmaking firm is about slowing people down and giving them a full picture of who someone is. Innovative Match arranges dates between clients across the political spectrum and encourages singles to have a face-to-face conversation before they pass judgment. Polling data from the Pew Research Center backs up Cassie’s approach. Even though 52% of Republicans and 70% of Democrats participating in a 2016 survey said they viewed people in the other party as close-minded, 51% of all voters said talking politics with someone they disagree with is interesting and informative. In 2016, Cassie published her first book, “Finding Love After 50,” as a guide for mature singles seeking relationships. Now, she is hard at work on a second book, which she expects to release in 2019. This next book will compile her greatest success stories throughout her 28-year career and identify the things that made these singles succeed in their relationships. Cassie’s new book will detail her successes as a professional matchmaker. Cassie said some of these couples wouldn’t have chosen each other without the prompting of a matchmaker, but by keeping their hearts open they realized they were the right match despite differences in politics, religion, or lifestyle. Her book will examine the case studies of clients who went on to meet their matches and form solid relationships or happy marriages. Cassie will then offer her insights into the mindsets and tactics that helped these individuals find love in the modern dating scene. Cassie said her goal is to see readers apply these lessons to their own love lives and create success stories of their own. Yet this seasoned matchmaker can only spread the word about what works — it’s up to singles to take it from there. A growing number of singles in the last year have let their political biases affect their dating decisions, and matchmakers across the country have had to adapt their matching systems or coaching consultations to keep singles from getting in their own way when it comes to romance. Cassie has been in the dating industry long before Trump, Tinder, or even Match.com came into power, and she has seen this phenomenon create global shockwaves that have impacted how singles choose their dates. As an experienced matchmaker, Cassie understands that 100% compatibility between two people is a myth, and couples often have to learn to compromise and learn to accept and love each other’s differences. She advocates for being open-minded instead of fixating on one area of incompatibility. In her matchmaking business, Cassie emphasizes the overall compatibility that can strengthen a relationship and lead to a happy and fulfilled life. Even in the midst of unprecedented political polarization, Cassie said she has hope that resentments will fade, prejudices will subside, and singles will realize that love is more important than politics.